It took about 12 years for me to reconnect with a friend from high school because she happened to coincidentally befriend my girlfriend at the time (now my wife) during their medical residency. As a result of these new connections made and old connections revitalized, we’ve had the benefit of dining out from time to time with this mutual friend and her husband. Lucky for me, our friends tend to suggest either new places I’ve never tried before or great places I get to revisit on these outings. This time around, they recommended that we go to Broadway Bistro where they had eaten before, but I had never tried. Always eager to try something new, my wife and I met them for an excellent dinner. Like many restaurants that are proud to have an establishment on Broadway in Providence, this restaurant is another that incorporated the name of the street into their name. I was informed by our friends and wife that the restaurant expanded a bit in size, however, from what I could tell, it was still a pretty small restaurant. This makes for a nice, warm atmosphere, but some longer wait times on the weekend. The hosting process at the restaurant is a bit confusing because the hostess that night seemed a little disgruntled and we weren’t sure where we were in the wait list. It’s somewhat understandable when the small restaurant gets crowded with patrons as well as people milling around hoping to get seated. Despite the “No Reservations” policy of the restaurant, when we asked if a couple of seats at the bar were open, one of the patrons that slid in to one an open chair said that the seats were reserved leaving us a bit more confused. Luckily, once seated, our server was pleasant, knowledgeable about the menu, and made sure the rest of the evening went smoothly. While everyone else ordered wine, I started dinner with a house cocktail from the menu called the “Just Beet It.” It was a silver tequila, beet juice, and lime cocktail that tasted pretty much like sweet, earthy beets with tequila and lime. All of the ingredients shone, but they also all worked together. I enjoyed this creative cocktail so much that I created my own copycat recipe of the drink at home (you can find the recipe for the “Every Beet of My Heart” Cocktail here). 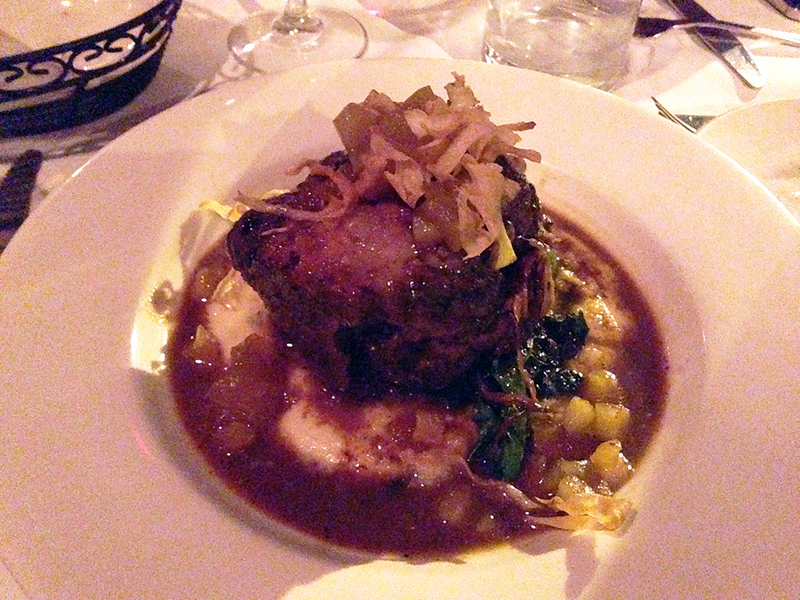 As my entree, I ordered the Pork Shank, which, as expected came out on the bone and extremely tender. The meat just fell away using my fork and the bed of mashed potatoes surrounded by charred brussels sprouts swimming in a light gravy really rounded out the dish. Admittedly, the pork shank isn’t as large or garish as portions I’ve had before, but it was very filling and satisfying. When dessert rolled around, we were all so full that we almost passed up this last course. 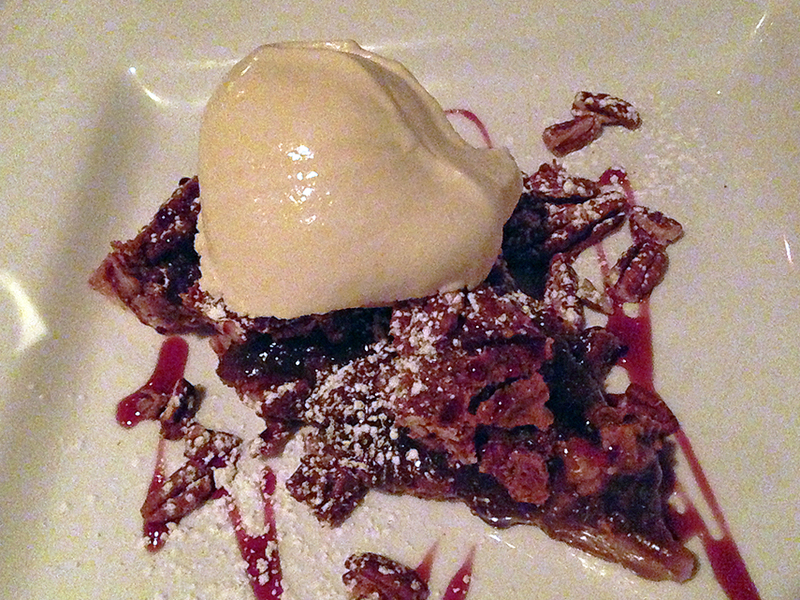 Out of morbid curiosity we asked about the desserts and our server informed us that they had a special house-made pecan pie with a bourbon glaze, topped with vanilla ice cream. Eyes widened ever so slightly and the four of us found more room somewhere in our bellies to accommodate sharing an order of this decadent masterpiece. When it came out, spoons flew as we all tasted it. The pie was so sweet it almost burned, but in a good way. The vanilla ice cream offset some of the sweetness and the bourbon glaze added a sweetly smokey depth to the entire dessert. We all agreed that this was an incredibly successful dessert that used such traditional a la mode items. 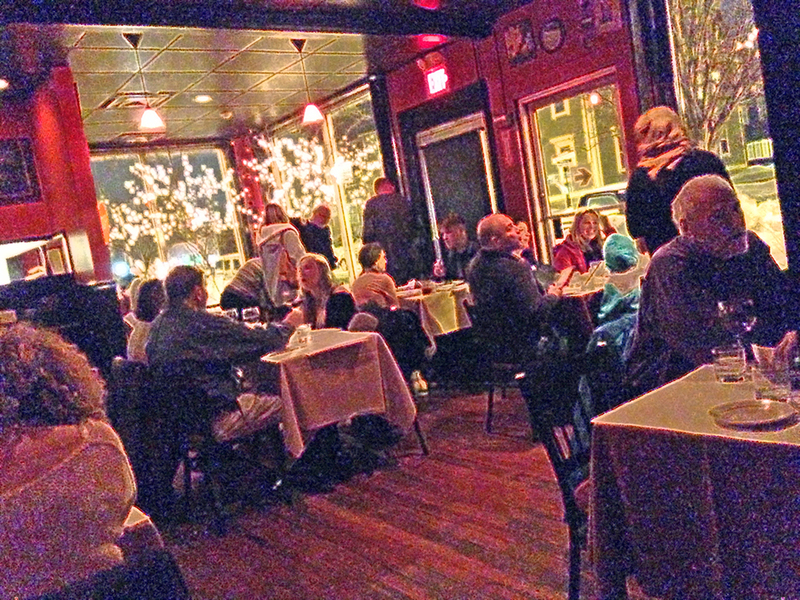 The food at Broadway Bistro is excellent, filling, and moderately priced for the quality. While they don’t take reservations, it’s worth waiting near the bar and ordering a drink or two before getting seated. 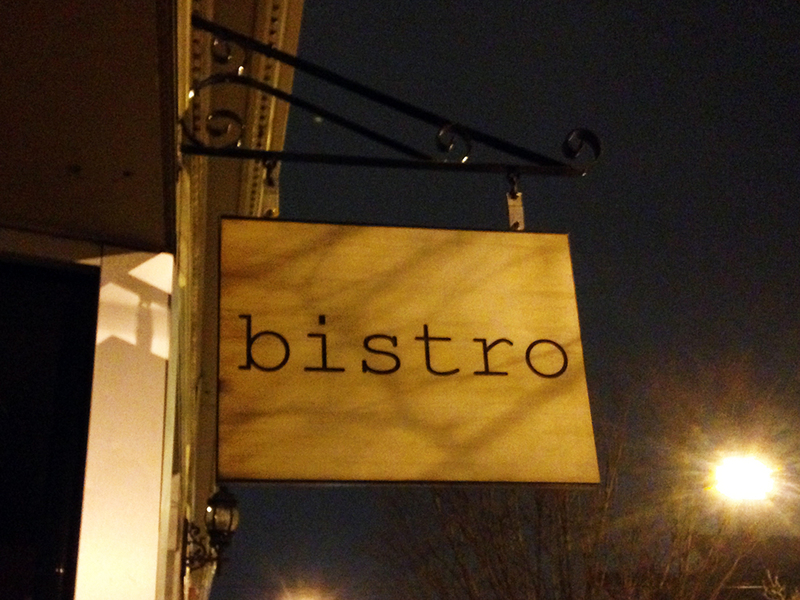 Highly recommended for a night out to a small, cozy restaurant with hearty home-style food. I apologize that none of the pictures on this post do the food justice, but it was pretty dark inside the restaurant.